8. Age determined at December 31 of the Championship year. 9. No player is allowed to play in more than one team and more than one category at the Championship. 13. 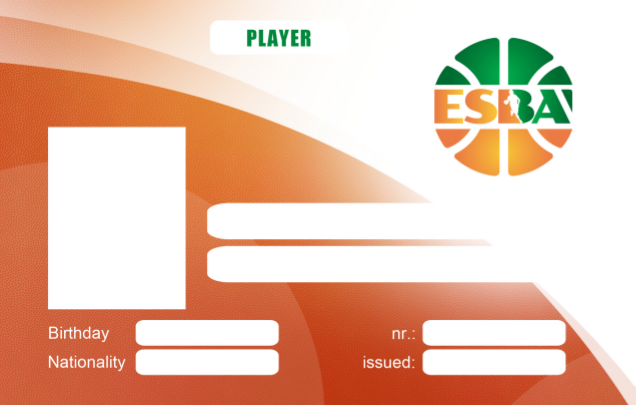 The Player ID card indicates the player’s name, surname and date of birth alongside a personal photo, the identity number of ESBA and the date of issue. 14. 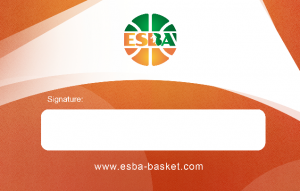 The personal information from a player’s ESBA Player ID will be reflected in the player’s profile on the ESBA official website. 18. 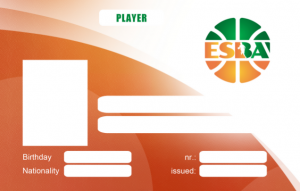 Player ID cards are provided free of charge for the first time. Any further production of them (in case they are lost or damaged) will be a paid service of 10 EUR per card. 34. The competition may be held in one or more groups depending on the number of registered teams in every category. The system of competition will be announced a week after team registration deadline. 35. The Championship will be played within 7 days (6 game days plus 1 rest day). 36. All teams will play a minimum of four (4) and a maximum of six (6) games during the Championship. 37. Every team shall play no more than one game a day and no more than three days in a row.